If you use the GridRad data in your research or for other purposes, please drop us a line and let us know how you are using it! *Maps for 1995 to 2003 are available on this web site now. The data files for those years will be available through the NCAR RDA soon. Please contact us if you have questions. Click here to download a sample GridRad file (~40 MB). 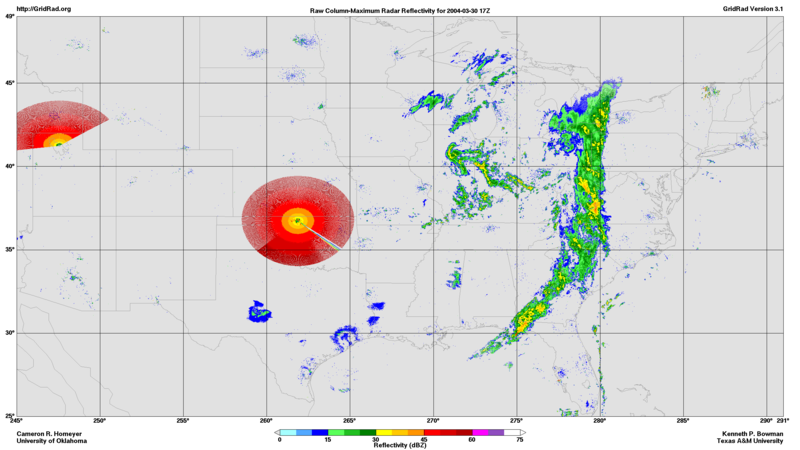 The GridRad data set consists of radar reflectivity data and radar coverage information from 125 U.S. NEXRAD WSR-88D radars merged onto a regular, three-dimensional, longitude-latitude-altitude grid at hourly synoptic analysis intervals. 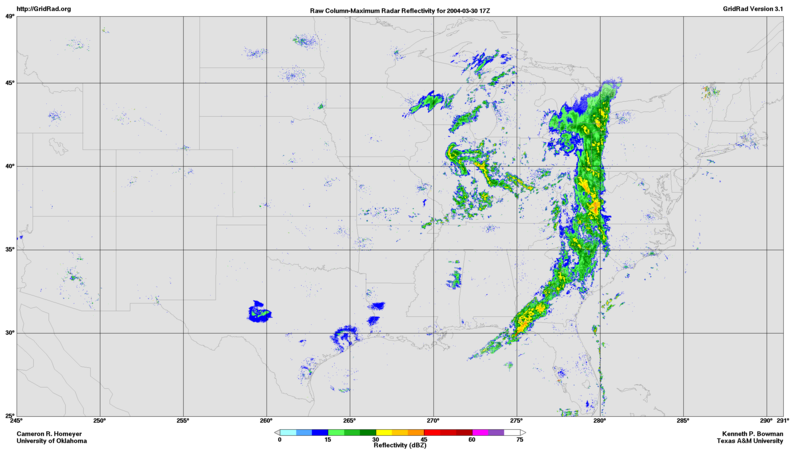 Each analysis uses all available radar azimuth scans within a specified time window centered on the analysis time (typically about +/-4 minutes). The size of the time window is stored in the GridRad files. Following conventional nomenclature, the NEXRAD volume scan files are referred to as Level 2 data, while the GridRad data sets are referred to as Level 3 data. The GridRad data are stored as netCDF-4 files, one file per analysis time. A sample ncdump is available here. The reflectivity (Reflectivity) and reflectivity weight variables (wReflectivity) are stored using a sparse storage scheme to reduce file sizes. All of the dependent variables (i.e, excluding the coordinate variables) are stored using netCDF-4 gzip compression. Note: The netCDF chunk size for 3-D (Nradobs and Nradecho) and indexed variables (index, Reflectivity, and wReflectivity) is set to the entire variable. Therefore, when reading these files the most efficient approach is generally to read the entire variable, rather than reading subarrays. IDL and Python programs to read and quality control the GridRad data files are available on the Software page. The Version 3.1 analysis currently covers the years 2004 through 2016. We are hoping to add analyses for 2017 this summer. There are 365 days x 24 files per day = 8760 hourly analysis files for each year (8784 files for leap years). The resolution of the analysis grid is 0.02° longitude x 0.02° latitude x 1 km altitude (~1.5 km x ~2 km x 1 km). The analysis domain covers most of the contiguous U.S. (CONUS), and extends from 245°E to 291°E (155°W to 69°W), 25°N to 49°N, and 1 to 24 km in altitude. The grid has 2301 x 1201 x 24 grid points (~66 million points). contains the GridRad Version 3.1 analysis for 2004-03-01 01:00:00Z. For a small number of analysis times, no volume scans are available from the NEXRAD network. Reading the GridRad files for these times will return data arrays that are filled entirely with zeros for Nradobs, Nradecho, and wReflectivity, and entirely with NaNs for Reflectivity. The files_merged variable will contain the string: "No NEXRAD Level 2 volume scan files are available for this analysis time.". Click here to download a list of files with no valid data. In the course of our research we have discovered a small number of analysis times with volume scans from individual radars that have gross errors. In the example below two radars (KVNX and KMTX) have obvious errors. Raw GridRad reflectivity map with bad volume scans - click map to download image. For this analysis time, we have re-merged the Level 2 data excluding the volume scans from those two radars. The result is shown below. Raw GridRad reflectivity map with bad volume scans removed - click map to download image. Click here to download a list of of the analysis times and radars with known bad volumes. In some cases the bad radar volume scans are not obvious in the reflectivity maps, but were identified by an echo-top height analysis. The GridRad files for those analysis times have been processed excluding the listed radars. Note, however, that we have not conducted an exhaustive analysis of the data set, and individual analyses in the GridRad archive are known to contain bad volumes scans. To download reflectivity maps with and without the bad volume scans, click here and here.